The Tippmann Gryphon Paintball Marker is a good paintball gun for beginners and casual players. It is lightweight and comes with a high-impact body suitable for extended hours of play. It is also ergonomically designed to complement a player’s mobility in the field. Finally, it can operate on both CO2 and compressed air. The biggest pro of this product is its basic body. It is easy to use and perfect for beginners. However, when the time comes that you would need an advanced gun already, you can easily customize the Tippmann Gryphon to upgrade it instead of buying a new one. The only issue that players have noticed while testing this gun in game play is its long trigger pull that may cause slower fire speed from time to time. Paintball is a really fun physical sport. It is unique in a way because it engages you in a sort of battle that can re-enact the favourite scenes you see in action movies and in an actual war. How? Well, to give you a brief overview of the game, paintball is an activity where you and your friends can engage in a battle with each other armed with paintball marker guns that sometimes even feel and look like a real live gun. However, instead of bullets, you will shoot them with paint pellets. Even so, these babies still hurt when it hits you and some people even claim that the feeling or the pain also mimics the exact same feel of getting shot in real life. But of course, the shot will not be life threatening. Just imagine the adrenaline pumping within you, when you are armed, in the battlefield, either sniping the heads off your targets one by one, or running straight into the battlefield Rambo-style shooting everything that moves! If you are a beginner, you are going to need to your own paintball marker gun though, and this is why we are writing this review today. Allow us to present to you what we think about the Tippmann Gryphon, one of the most popularly recommended paintball marker guns for beginners. 1. It is affordable. One of the best things that you might notice when you are opting to buy a Gryphon is its price. Its price range is obviously cheaper compared to other paintball marker guns in the market, not to mention that it comes from a reputable company as well. 2. It is easy to use. This is the primary reasons why Gryphon is highly recommended by advanced players for beginners, because it is simpler and a lot easier to use compared to other paintball marker guns. 3. It is lightweight. While a lot of manufacturers claim that the weight of the gun adds to the realistic feel of a paintball marker gun, heavier guns are more difficult to manage and control, especially when used by beginning players. You won’t need to worry about the weight of the Tippmann Gryphon though, because it is very lightweight. This also makes the gun easier to carry around if you are the run and shoot type of player. 4. It can easily be upgraded. This is one of the signatures of Tippmann guns. Their products can easily be modified according to the needs of the player. So, for beginners, this is definitely a paintball marker gun that you can grow up with as you advance in the field. Now, if you are already contemplating about purchasing the product, then you will find that buying a Tippmann Gryphon Paintball Marker Gun is really easy. You can search for it online and easily purchase it through Amazon. You would not be having trouble finding this baby in paintball specialty shops as well because of its popularity. 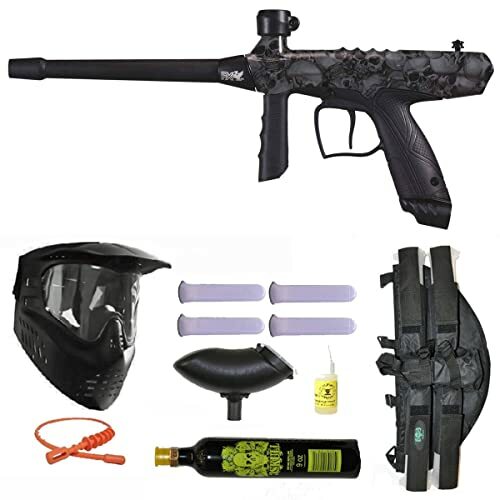 The paintball marker gun will come in a package that usually includes the following: the Tippmann Gryphon Marker, the mask with an anti fog lens, the CO2 tank (please note that this is shipped empty), the harness along with the paintball clear tubes, and finally, a 1oz bottle of Gold Cup Oil. Let us now move on to the features that you are going to enjoy with this paintball gun. 1. An internal gas line. Unlike other paintball marker guns, the Tippmann Gryphon has an internal gas line that provides a cleaner look, not to mention that it is also more convenient. 2. Additional features for maximum mobility. To ensure that you are not going to get thrown off your game, this paintball marker gun is designed with an ergonomically-designed front grip (much like a .48), and a center-feed. 3. Runs on both CO2 and compressed air. A lot of players swear by air because it is more affordable and a lot of fields refill it for free. Some though prefer the CO2. Eitherway, this paintball marker gun can use both, and it even comes with a 9oz CO2 tank. 4. High-impact body. Staying true to the Tippmann brand, this paintball marker is also built in a high-impact body with fewer moving parts to minimize wear and tear, even after hours of game play. The Verdict: Who Needs This Product? In the end, our professional players have tried and tested it. And we have proven that the Tippmann Gryphon Paintball Marker Gun is indeed perfect for beginning players looking for a gun that is lightweight and easy to handle. Having said that, this paintball marker is also perfect for those who enjoy playing the game occasionally. Casual players will enjoy the price that it comes with, and the highly customizable body. To support our own research, we have gone through different reviews of other customers who bought this gun (mostly from Amazon). We have found that the feedback is the same. According to the reviews, a lot of people buy this paintball marker for their kids, around pre-teen to teens who are just beginning players. Overall, if you are looking for a basic gun that provides the best value for money, then you would not regret taking this baby home with you. It is a complete package that gets the job done right with a decent firing rate as well.